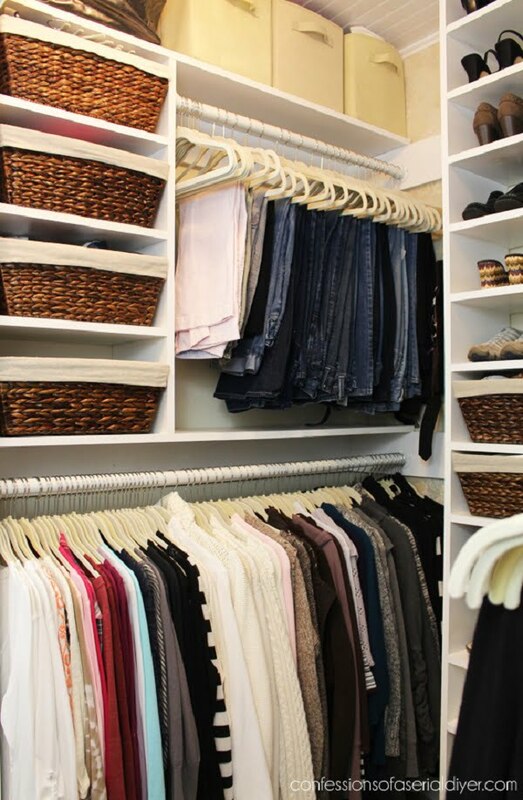 Want to reorganize your closet system for better storage at home? Here are the most creative DIY closet organization ideas on a budget that will help you do that in style. The closet is the least seen part of your home. Most guests probably won’t ever see it at all. But that doesn’t mean it has to be a mess. First of all, you want your closet to store your stuff in a convenient and easy to access way. You want to use the closet space efficiently too. At the same time, it’s always a pleasant experience to see a well organized, stylish closet. Perhaps you’d even like to decorate around it a bit too. All that can be achieved if you put your mind to it. 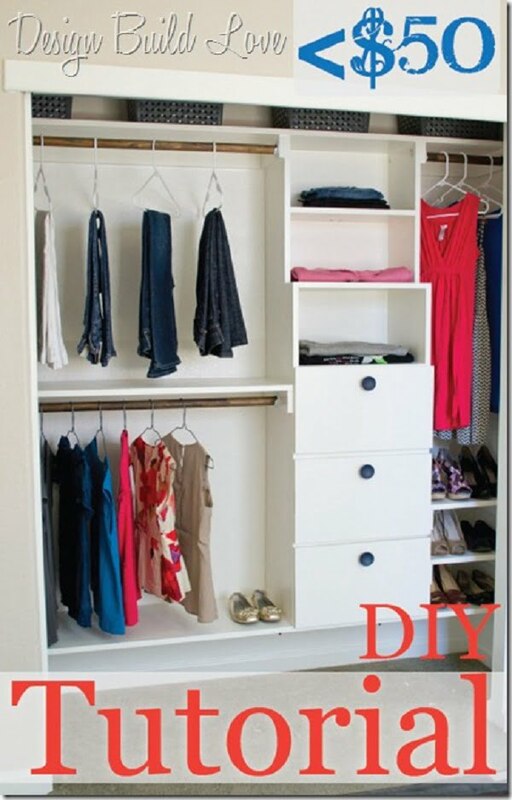 And we are here to help you with 20 brilliant DIY closet tutorials. The whole idea behind building a DIY closet is the function. Of course, you want it to look nice, but being able to create your configuration is key. So this project is all about creating the closet that you need. You will build this organizer entirely from wood boxes. So you’ll need to pick up some plywood boards and follow the plans to make the right configuration. Of course, you can and should adjust it to your particular closet space. If your closet doesn’t have dedicated space for your jewelry and accessory organization, you need this project. The idea is simple – use the empty wall space to create an organizer from hangers. And while it’s simple enough, you have to take care of the style too. This project shows how to use classic white boards with gilded hooks. The simplicity is charming. And we have to say; such an organizer is very convenient too! 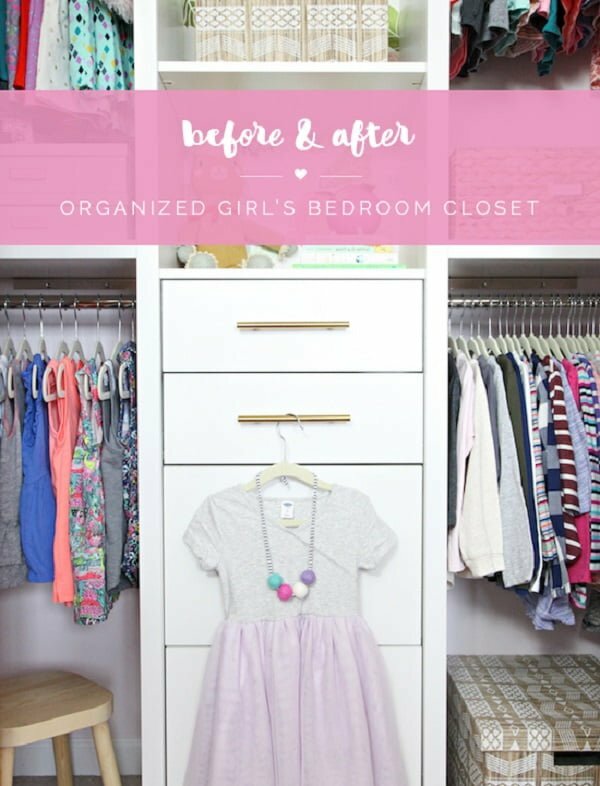 Take a look at the before and after pictures of this DIY closet. That’s an impressive makeover, isn’t it? But the idea is quite simple. There are only a cabinet and wall shelves involved. 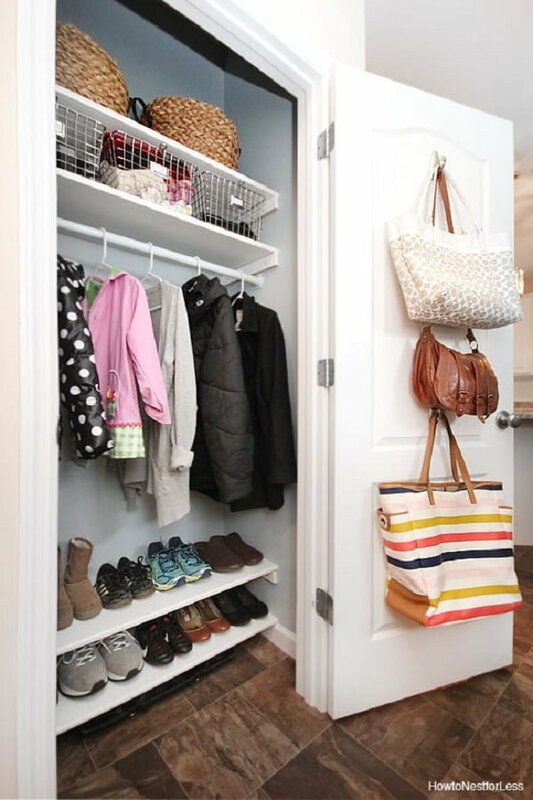 Add to that a door storage rack, and you have a very roomy closet that uses limited space to its full potential. 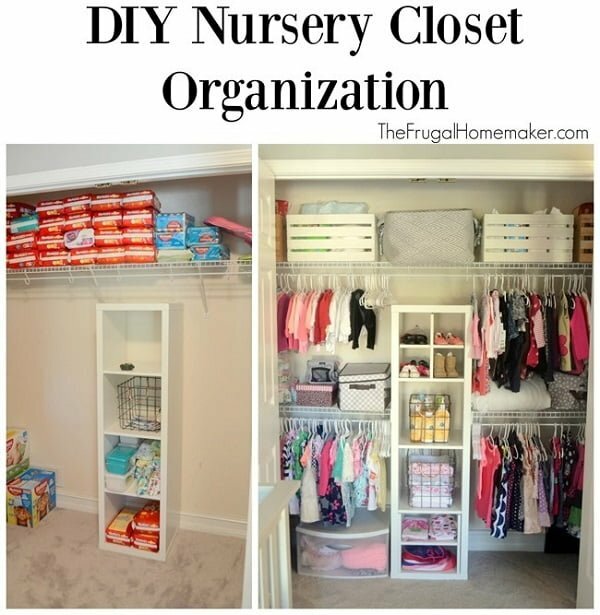 If you have a small closet that you need to revamp, this project will serve you as great inspiration. 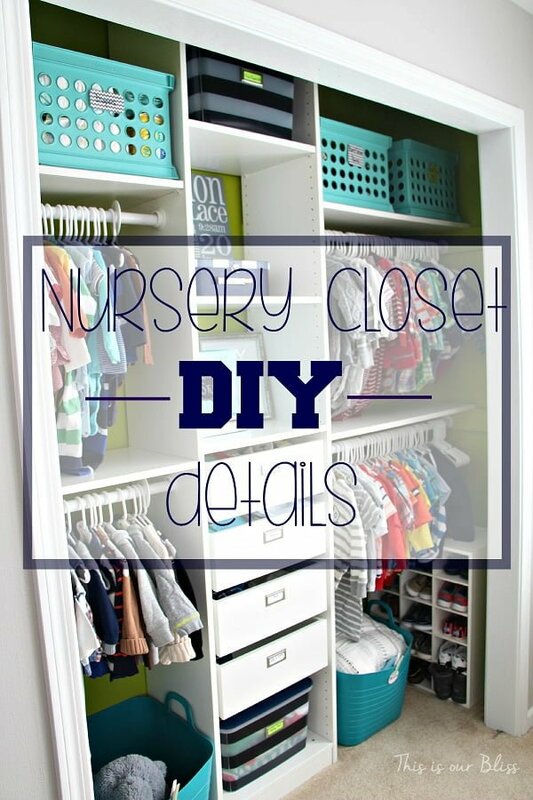 If you’re looking for an inexpensive way to build a DIY closet, this is the project for you. All you need is a small IKEA Billy bookcase and storage racks. The rest of the project includes setting up everything according to your closet space and your needs. 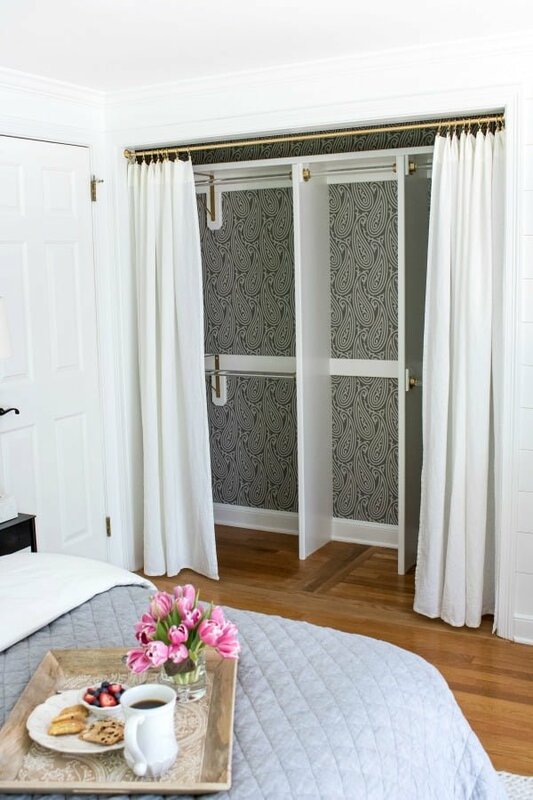 This project is a great way to easily install a full closet organizer regardless of your space configuration. If you need to build cheap shelve as your DIY closet system, this is the project for your inspiration. 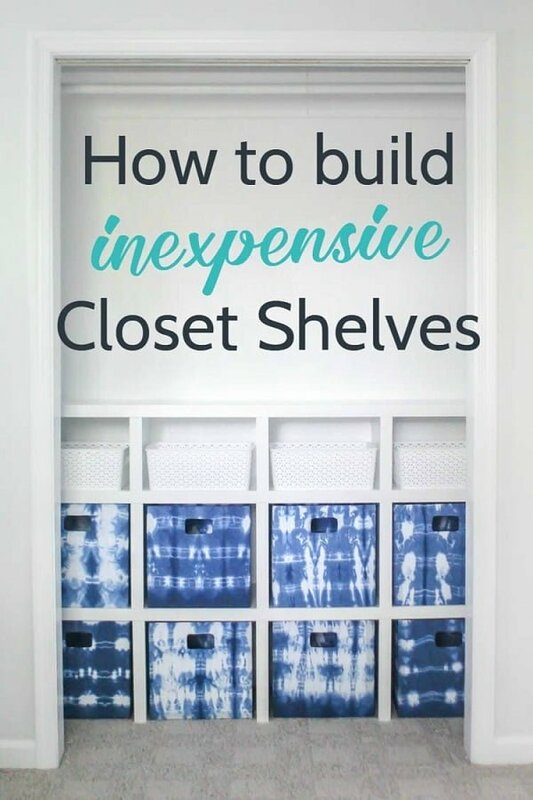 It will give you the idea of how to plan and make the shelves in your closet. Other than a suitable configuration, it provides a nice style too. You’ll need pine boards and MDF sheets to set up the shelves. Everything else is straightforward if you follow the plans and instructions. Have fun! If you’re looking to make the most of your closet space this project will give you the idea how to do that. That’s no corner left unused in this closet makeover. And while initially, it was just a coat closet, it was transformed into something more. Check out how you can install extra shelves and even use the inside of the door space to organize your things. It’s a fun and creative project for the weekend to take on. The closet space is never perfect. There’s always awkward space that stays unused and remote corners where you can’t access your things readily. You can always reorganize to achieve better storage system. But it isn’t always as straightforward as you’d like it to be. In this project, you will see how you can reorganize your shelves and cabinets in the closet for the best storage solution. Add shelves for extra space and remove them where not needed. Add drawers and cabinets to hide away stuff that needs not to be seen. 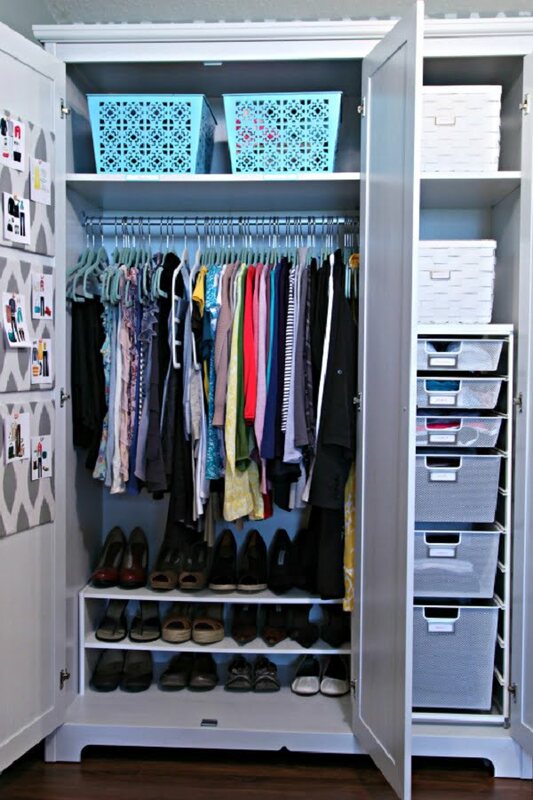 All in all, this project is full of great ideas that you can implement in your closet at home. Closet space is very different in every household. There are no standard measurements to take and use. You always have to adjust no matter which project you take on. But the ideas are universal. So you can use them in any closet of very different sizes. 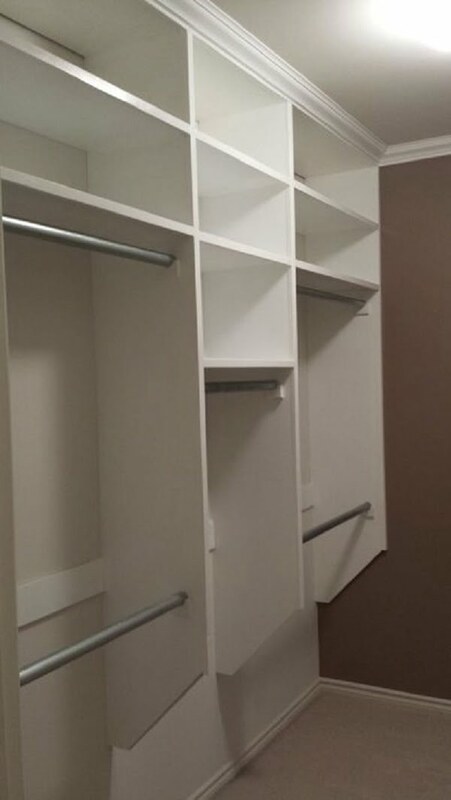 This project shows you how you can use three essential parts to create a closet system. These include the top shelves, the bottom shelves, and the divider cabinets. It’s a simple system but a functional and stylish one. Do you like woodworking? If you do, then we have a treat for you. You can use these plans to build a complete closet system in industrial style. And more importantly, you can create it in any size you need. The DIY closet storage system you’ll be making consists of wooden shelves and galvanized pipe hangers. These are the elements that create the industrial style. And the kick is that it’s an easy project to do. So let’s go to the woodworks! For a complete closet makeover, you don’t need to go further than the nearest IKEA and a hardware store. There’s everything you need, and it doesn’t cost much. 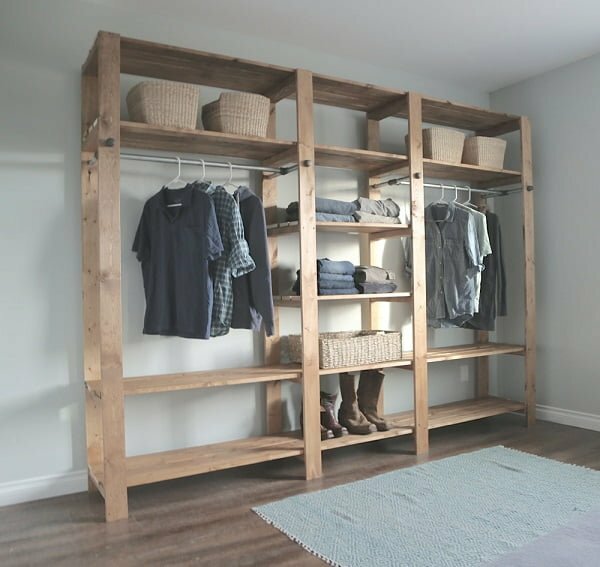 This project shows you how to correctly use these essential elements to create a complete closet system from scratch. 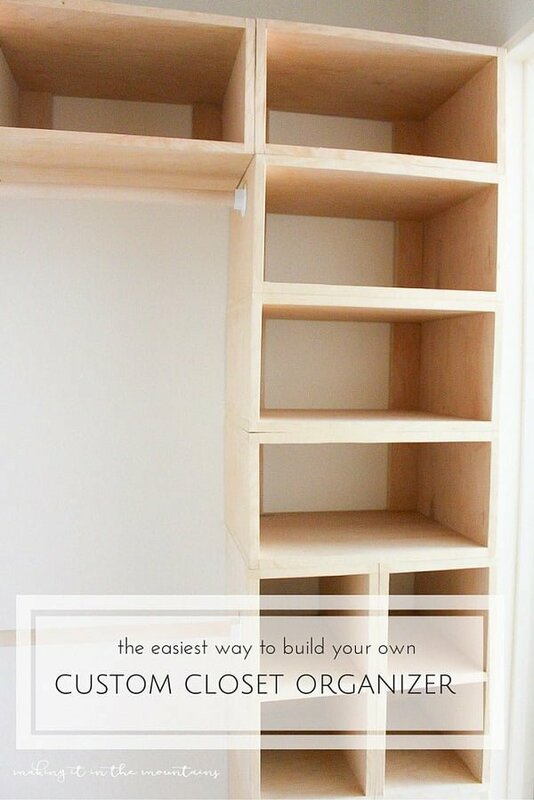 You will build some shelving and a divider cabinet. This combination proves very versatile and useful. Use the instructions in the tutorial to complete the project at home. 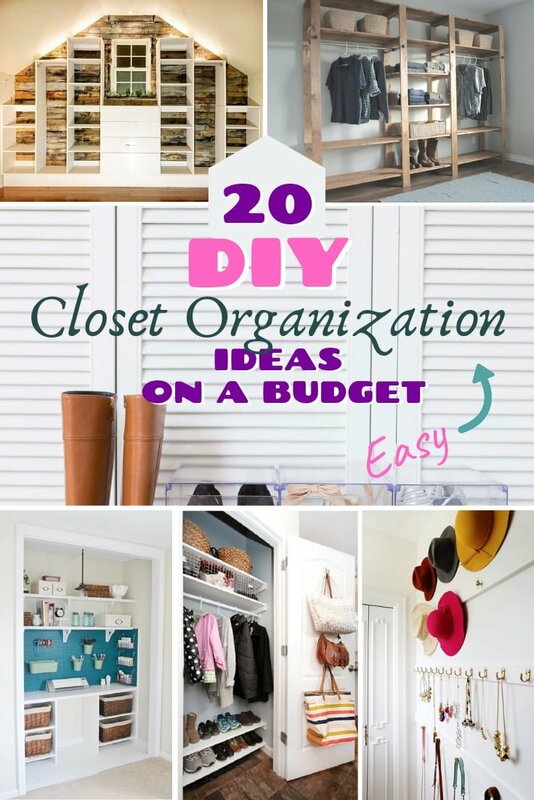 Can you believe that a DIY closet makeover project can cost as little as $10? 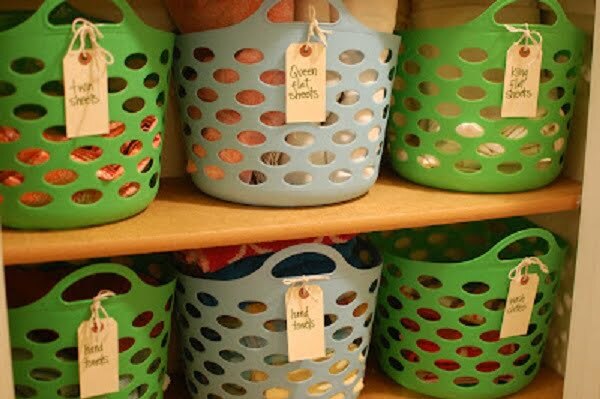 That’s the cost of 10 dollar store baskets, and this project shows how you can use them to redo your closet. It’s a simple idea, but you can get great results. Go ahead and buy some colored baskets in the Dollar Store and choose the colors you like. While they come in vibrant colors, they make a lovely popping accent which works in contemporary decor. 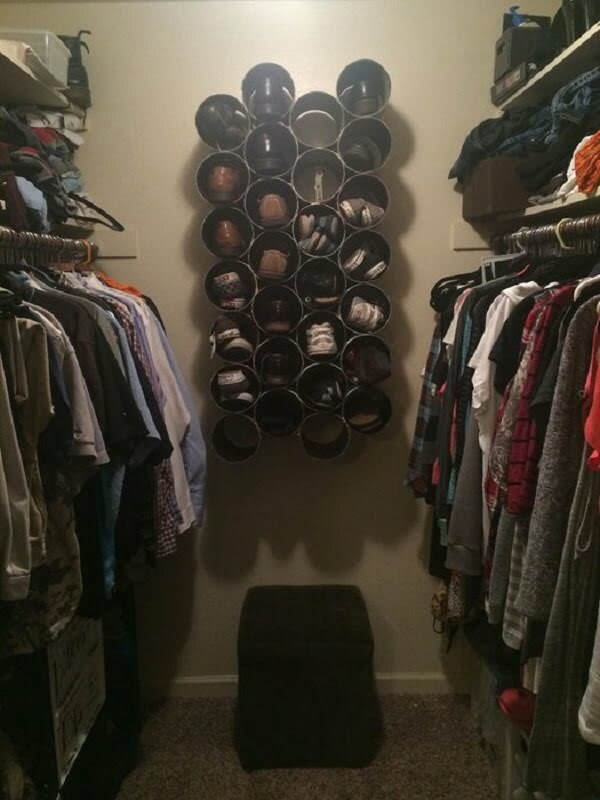 Here’s a brilliant idea for a DIY closet makeover. All it takes are a few plastic baskets. These are very cheap to get in a hardware store. 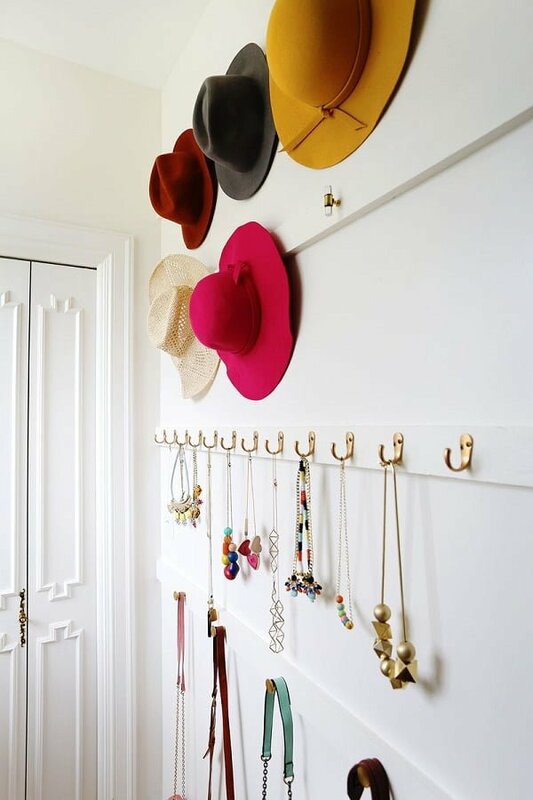 The trick is to hang them under the shelves in your closet. This way you’re making use of the space that is always left unused. It’s a very functional way to improve your closet space, and it’s a stylish one too. If you have large closet space, to begin with, you have a lot of options. This project gives a great idea of how you can build a large DIY closet using all that space. It includes shelving, coat hangers, and cabinets. Check out the tutorial for the list of materials and the instructions. You’ll have a lot of fun with this project. Nobody wants all of their stuff to be on the view. That’s what closet doors are for, but they make a small room seem very closed in. The solution is replacing the doors with curtains. This project shows precisely how to do everything. Check out the details and instructions in this tutorial. Can the closet be more beautiful than your living space? If you build your DIY closet creatively, it sure can. 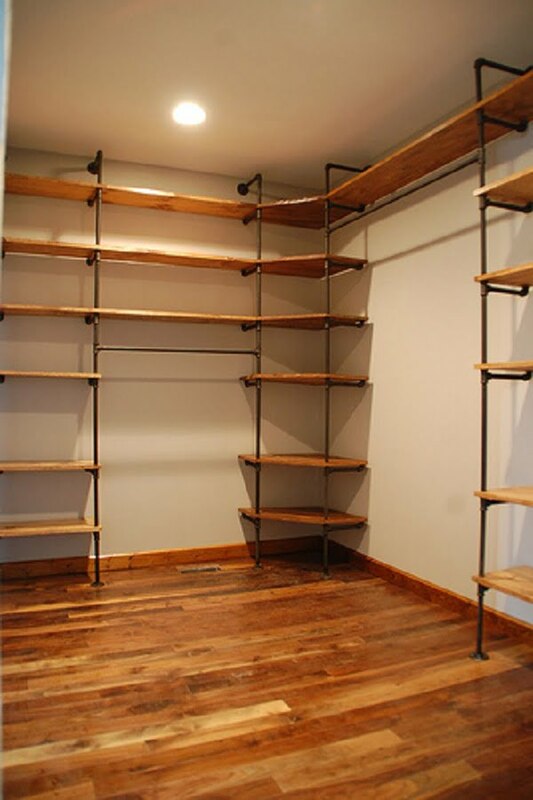 How about some rustic shelving with industrial pipe accents? It makes an Instagram-worthy wardrobe! You need to have a large enough closet space for this project. But if you do have one, there’s all the more reason for this style. 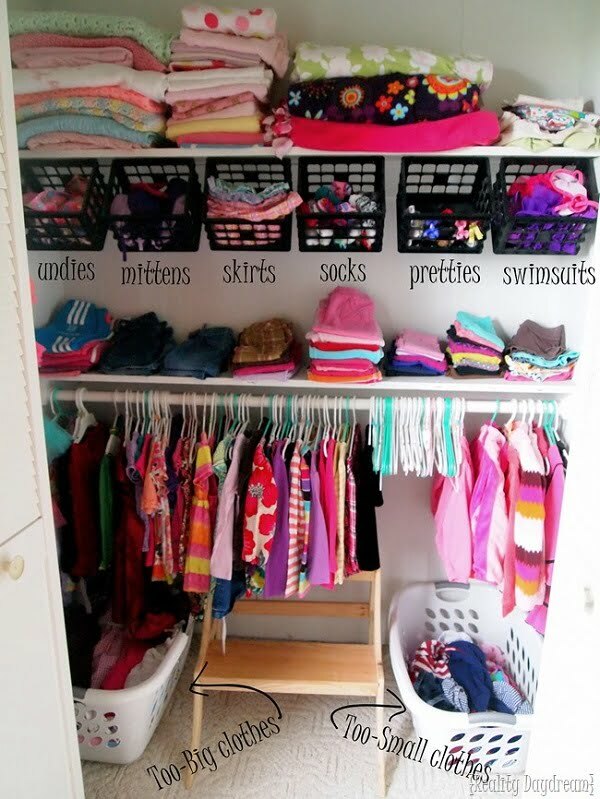 Let’s decorate your closet! If your closet needs cabinet units, you may need to build some yourself. That’s precisely what happened to the author of this project. And you’ll be able to use the same instructions and plans to make it. Check out the tutorial if you want to build cabinet units for your DIY closet. Slated ceilings are not a sentence. You can build a perfect DIY closet in this limited frame. This project shows precisely how to do that. 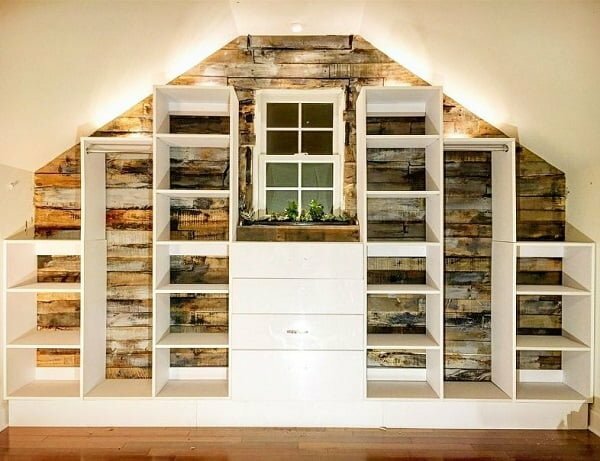 To top it off, there’s a pallet wood accent wall to create rustic style. Check out the tutorial and have fun! This project is for those who like their DIY projects to be creative. You can use your creativity even to build something seemingly trivial as a closet. And this tutorial will give you one idea. 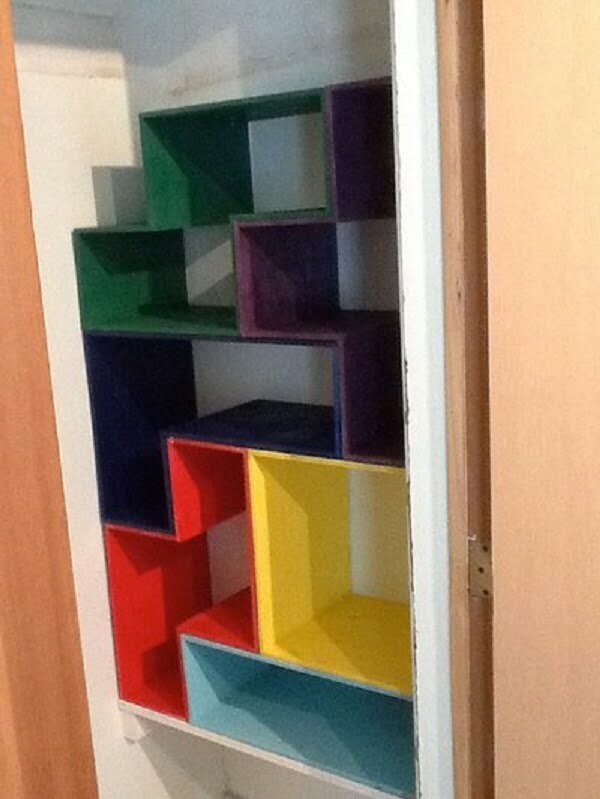 You can build a DIY closet shelving in the shape of Tetris. How good were you at the game? It’s time to brush your skills and store your stuff Tetris style! Having a lot of shoes requires special treatment. Your closet needs to have a separate storage unit just for that. And here’s an easy way how to build a shoe rack from PVC. It’s a fun project to take on, and you can complete it overnight. Pegboard allows you to create an organizer wall even in the closet. It’s not only good for storage but as a decor accent as well. 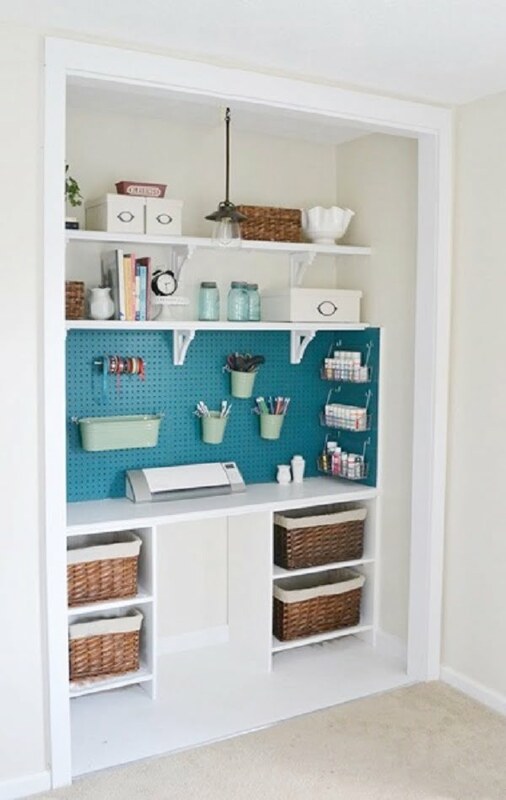 Check out this project idea for a complete closet makeover which includes a pegboard and more.